SplitScreen for up to 4 players (currently optimized for 2) in cooperative mode on a single PC!!! (SDL) Support for both vertical and horizontal splitscreen and many special cooperative game modes that add endless replay value and tactics to classic maps. Minimap/radar support. Support of Wolf3D and Spear of Destiny (none of the original files included in the pack) Coding: LinuxWolf Additional art: DoomJedi Title Screen: Atina Read Readme.txt before playing! 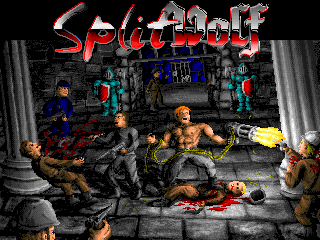 No more public betas, time for SplitWolf 1.0 from "Team RayCast" - full release of the only SplitScreen 2-player coop engine for Wolf3D, with many special coop game modes and interactive features to add endless replay value and fresh tactic gameplay to classic Wolf3D/Spear maps. So grab a friend and enjoy classic maps like never before! Game Modes include Instagib, Carry the Flag, Harvester and many others. It supports classic mappacks (that have no code changes, just new maps). We do plan to make special SplitWolf maps in the future. More advanced wolf3D mods obviously have unique coding features (coding-wise) that will conflict, but also art-wise all enemies and Bosses need full 8-direction frames, including (non-existing in those mods) directional pain and shooting frames for enemies etc... So it'd be unplayable both artwise and coding-wise. There are plenty of Wolf3d mappacks outthere you can play, just replace the map files. BTW, is this based on wolf3dsdl or on ecwolf? I put the mod in the wolfenstein folder but I cannot play split screen, help!